We’ve spoken to a lot of professional athletes and one question we always ask them is what tech they use to train with. Whether it’s ultrarunners or triathletes, there’s a sports watch that gets mentioned more often than most and that’s the Polar V800. 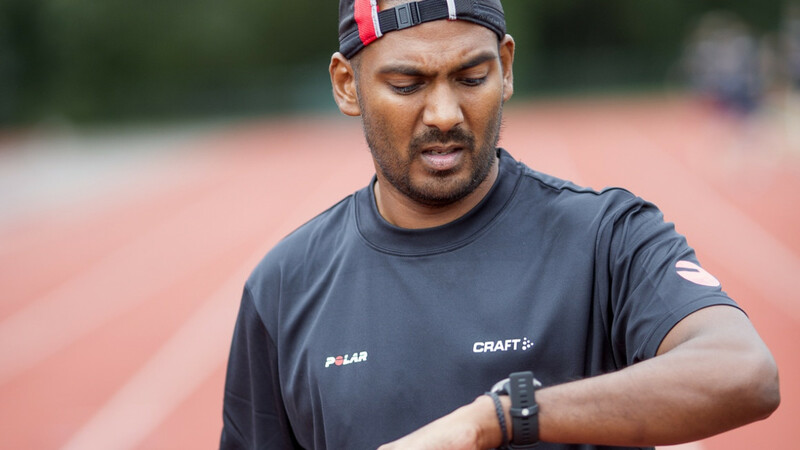 That beast of a sports watch is a popular choice for those who have to train multiple times a day and participate in events that can last a number of days. It’s got that mammoth battery life, durable design with a big screen to cram in a whole lot of data, and those coaching tools to help you train smarter. The V800 launched in 2014, which doesn’t feel that long ago, but in tech terms, it feels like it’s well due a refresh. Since then, Polar has extended the life of the watch for pros through a number of software updates, adding features like its adaptive running program, GoPro support and even 24/7 activity tracking. Polar says it didn’t want to offer a follow-up to the V800 until it had something really innovative to show off that would blow its competitors out of the water. Now the Finnish company believes the time is right and that’s why we have the Polar Vantage V. This is now its premium multisport GPS watch and natural successor to the V800. It’s joined by the Vantage M (successor to the Polar M430), but it’s the V that V800 owners will now be casting an envious eye over. 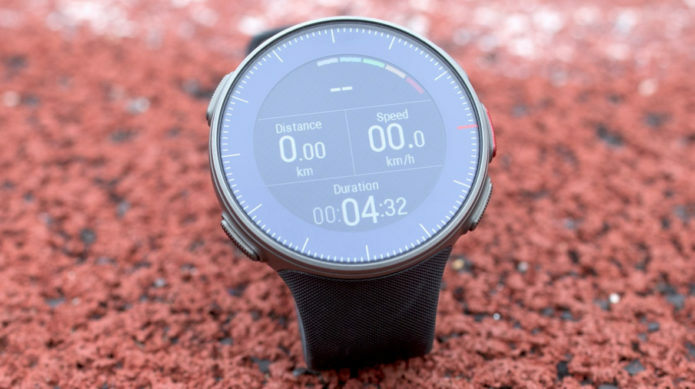 We were among a fortunate few that got try out a beta model of the Vantage V to find out what it’s bringing to the sports watch party and how it could give Garmin and Suunto something to worry about. The V800 was a sports watch built to withstand serious carnage on land and in the water with its 12.7mm thick stainless steel body and rugged silicone strap. If you put it up against a Fenix 5 Plus or the Suunto 9, it’s a giant in comparison. Thankfully, things have changed radically on that front with the Vantage V. The rectangular screen is gone (which I’m sure will please most), and is replaced with a 46mm, circular body that gives it a stature that has more in common with a Fenix or a Forerunner watch. It’s actually thicker (now 13mm) than the V800, but you really don’t notice that extra heft. It’s a significantly nicer looking watch and one you’d actually want to wear all of the time. Despite the look switch up, this is still built with rugged use in mind. You’ve got stainless steel casing and even the silicone strap has a softer, more flexible feel that makes it sit more comfortably on the wrist. Those straps are not interchangeable unfortunately and while they do come in two sizes, those two straps are not bundled together. The new screen has an always-on colour touchscreen display that’s nicely responsive and doesn’t lag when you’re swiping through the screens. If you’re expecting the kind of touchscreen you get on an Apple Watch or a Samsung Galaxy Watch, well, you’re out of luck. But that’s no real surprise when Polar has tried to strike a good balance between offering a display that’s more vibrant than its predecessor, but still offers good visibility and shouldn’t demand too much of the battery. Along with touchscreen navigation, you also get five physical stainless steel buttons dotted around the display. Working out exactly what each of these buttons does take a bit of time, but the textured finish means even if you’re wearing a pair of gloves, you should have no problems getting to that data screen you quickly need to see. Before we get into the big headline features, we do need to talk about the Vantage V’s sports tracking skills. And they’re plentiful. There’s 130 sports profiles, which includes running, treadmill running, cycling and swimming (indoor and outdoor). You’re also getting fitness tracking too including sleep monitoring, although seeing your sleep data on the watch is not supported just yet. We’re told it will be added in an upcoming software update. As a company, Polar’s heritage is built on advances it’s made with heart rate technology. With the V, it’s trying to do what most other wearable makers have failed to do so far and that’s to make an optical heart rate monitor that you can truly rely on. Polar says it has cracked it and believes it’s come up with the best wrist-based solution available. How has it done that? Through what it’s calling Precision Prime technology. It’s still using a similar light based method that the likes of Apple, Samsung, Garmin and others use, but it’s added additional LED sensors that can penetrate the skin deeper to get more reliable readings. It’s now using a 9 LED setup that includes 5 green LEDs as well as four red LEDs. This is the first time that red LEDs have been added into the mix. But it’s also adding electrode sensors for measuring the sensor’s contact with the skin to ensure a reading is taken when the sensor is in proper contact with the skin. This new sensor setup should be fit for all sports and we’re told it’ll even work for swimming, offering more accurate insights into aspects like training load and calorie burn. Polar still regards its H10 chest strap as the best heart rate solution for serious athletes and is still required to carry out a number of the training-centric tests available on the Vantage V (like the orthostatic test). We’ll need to spend some more time testing it to see if Polar has managed to nail it on the accuracy front. What we can say is that unlike our initial testing with the Polar M430, it did successfully produce a reading on dark skin. So hopefully everyone should be able to benefit from the new tech, too. The other headline feature of the Vantage V is running power. A new training metric for runners we tipped to be a big deal in 2018. We’ve already been putting some wearables that deliver running power data to the test, like the Stryd footpod and Garmin’s Running Dynamics Pod. 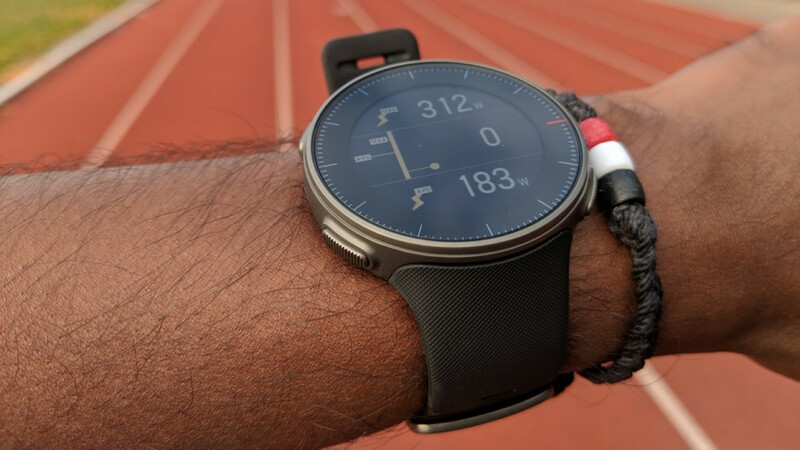 But this is the first time that a watch has built in the ability to measure running power from the wrist. We’ve summarised what running power is before, but to explain briefly here, it’s a training metric that has been used in cycling for some time and is starting to find its way into the running world. Similar to training with heart rate data or even pace, it gives you one number that tells you instantly, and in real time, how much work you are doing. It helps to measure and assess external work rate more reliably and should lead you to running more consistently and at your best. To make this happen, Polar bases this power score (in watts) on speed, how fast speed is changing and your current altitude based on data from the onboard barometer. When you start a training session, the watch will show you details on average, max and real-time power scores. Post race-session, it’ll also offer details on muscle load and power zones that resemble presentation of heart rate zones. 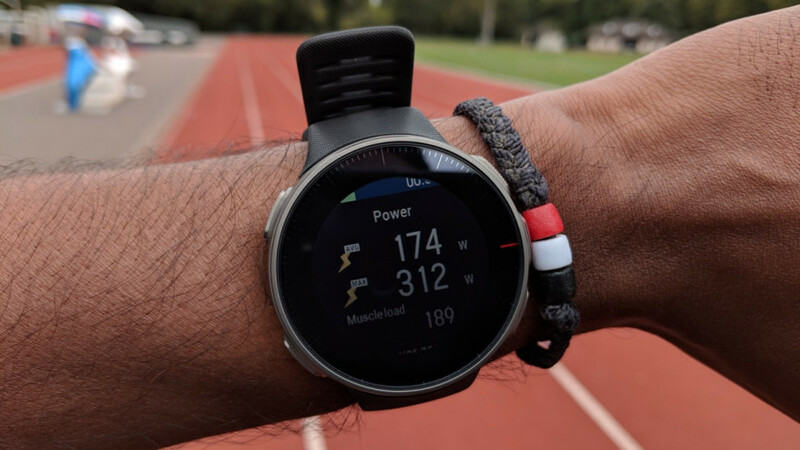 On a couple of runs, we compared the real-time power data to Garmin’s Running Dynamics Pod (which you wear on your waist) and the V tended to display a higher power score. Again, more long term testing will be needed to determine with this power data is reliable. What’s more interesting is that the introduction of power is geared towards optimising training sessions, but not about taking that power data into a race scenario like you can with Stryd. Surely it would make sense to train on power and then race on power too? Along with the introduction of running power for training, Polar also packs the Vantage V to the rafters with other features and metrics that are designed to help you optimise aspects of your training. There’s now Training Load Pro that can collate muscular load, perceived load and cardiovascular load to indicate when you’re undertraining, overtraining or hitting the sweet spot for training. It’ll also offer personalised training advice each day to help keep you on top of your training. Recovery Pro measures daily and long-term recovery, while the Polar Flow for coach online service offers will be a source for training plans you can follow. 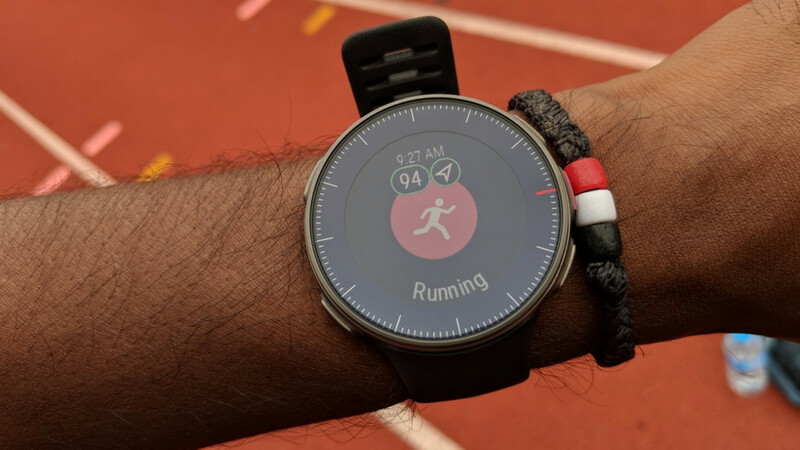 You’ll also find support for Polar’s Running Program, letting you follow plans from the watch, and Polar’s latest Sleep Plus monitoring is also on board too. 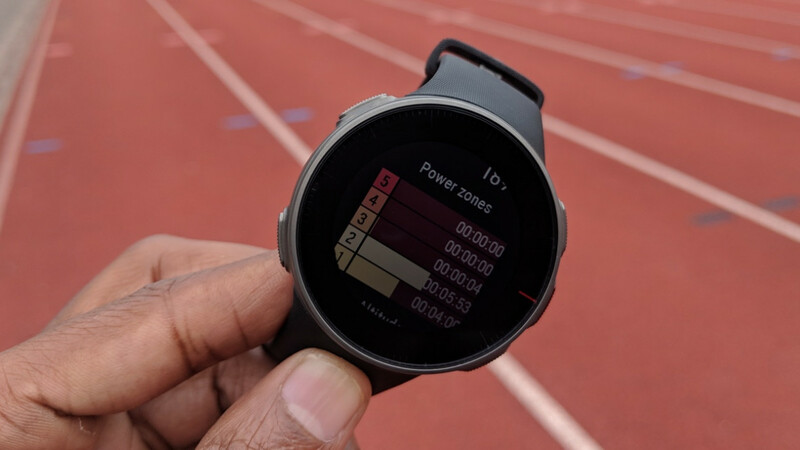 All of this data is of course reviewable in the Polar Flow smartphone or web app where you can dig a little deeper into what it all means for your training and race day. It’s going to take a whole lot more long-term testing to find out just how good the Vantage V is of an upgrade on the V800. We’re talking aspects like running power and the new training and recovery features. If it really has managed to nail wrist-based HR as well, that’s a huge coup for Polar. There’s also a fair bunch of features that Polar promises still need to be rolled out over the coming months as software updates too. Right now, it’s not quite the complete experience. 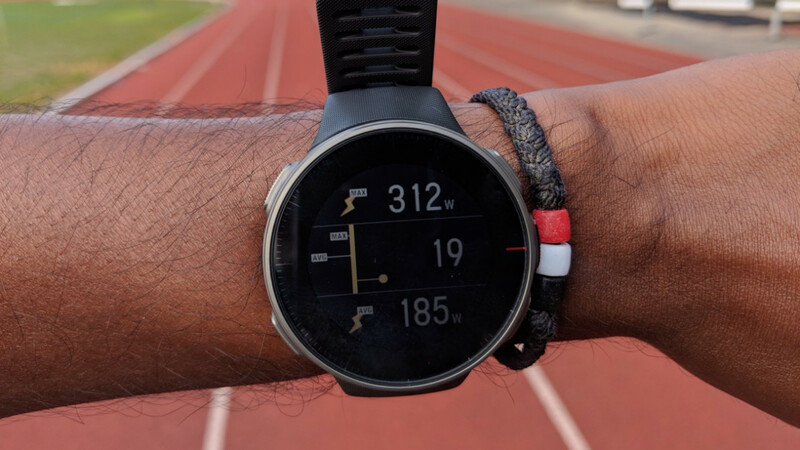 What we can say is that we’re loving the design changes, the prospect of reliable heart rate data from the wrist and seeing what running power can offer in the way of training and race time. Everything that was great on the V800 is onboard here and that can only be a good thing. The £439 price tag is inevitably high and puts it up there with the best that Garmin and Suunto’s high end range have to offer. Once Polar gets all of the promised features rolled out, the Vantage V on paper has the makings of being a fitting replacement for the V800.